Chafed Thighs, Arm Pits or under you Breasts! Chafed Thighs, Arm Pits or under you Breasts! We know the problem and now we can help in reducing the effect; making the summer months and your holiday time more comfortable for you. In extreme temperatures or hot climates, your body can develop rashes and the skin can get chafed. Chafing is skin rubbing on skin or on any surface such as synthetic clothing or other material, thus getting red and irritated. Chafing often happens in people who are overweight or who wear ill-fitting clothes. 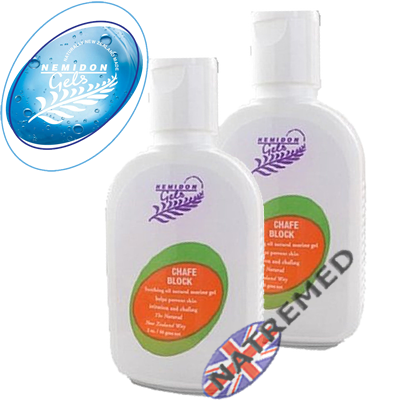 Nemidon Chafe Block: A soothing natural gel that helps prevent skin irritations and chafing from friction - especially between the legs or under the arms. It allows the pores of the skin to breathe and allows water or perspiration to pass freely whilst still providing a natural barrier against potential irritations including wind and sun. It even helps prevent blisters on your feet!. Which is good news for diabetics. Remains on the skin when sweating or in cold water. Helps prevents blisters on feet. 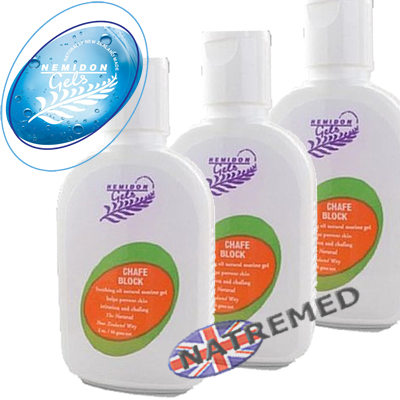 Will remain on the skin through sweating and cold water, making it ideal for tri-athletes.